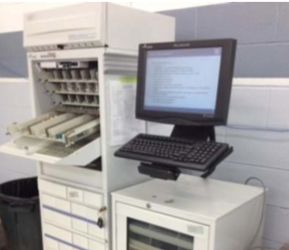 A leading global pharmaceutical distributor hired PEKO, an ISO 13485 registered Contract Manufacturer, to redesign and manufacture an automated medical supply dispensing and inventory management system. This system featured a high degree of mechanical and electro-mechanical complexity and production volumes of 100s of units per year. The system design as received, did not allow for a direct drop-in field replacement to their largest competitor and current lead times for customized configrations were unacceptable. Additionally, new functionality was desired but the technology required had not yet been fully developed. PEKO took on the production manufacturing without any interruption to the customer’s supply chain, while simultaneously addressing the redesign requirements. PEKO’s capabilities within a single organization allow for this successful parallel path approach, as appropriate internal resources address each of the required roles. Throughout the development process, extensive testing and FMEAs were completed to comply with stringent medical product codes requirements. Design changes to improve manufacturability and reduce lead time were also implemented. PEKO’s versatile “toolbox” of resources provided our customer with a single partner to accomplish the extensive list of product developments requested. PEKO successfully manufactured this as-received product line while designing the next generation platform while incorporating manufacturability improvements and market research results. The customer received the functional product results and production lead times desired. A configurable ordering system was created to ensure the final end-user was able to order exactly what they needed and the subsequent assembly time was driven down to 1 week. This new system provided additional value to end users and further drove the customer’s sales.